Liis Windischmann is sharing her confidence again. In her quest to encourage women to accept their unique beauty whatever their size, tonight in Toronto, Canada&apos;s most successful plus model is hosting an event that celebrates diversity with a fashion show that features models from sizes 12 to 20. "I&apos;ve met so many incredibly fashionable curvy women with no outlets to express their fashion sense -- no runway shows, no events, not much selection in stores," says Liis. "I want to start putting fun into curvy fashion so the curvy consumer never again finds herself on the outside of fashion looking in." Favourite skincare: I&apos;ve used Jamieson Vitamin E for years; my skin loves it. I put it on every night to let my skin absorb the vitamins while I sleep. Favourite beauty tip: Start your blush application from your hairline and sweep toward the apple of your cheek. It&apos;s the opposite of what we&apos;ve all been told, right? But a makeup artist did that on me for a photoshoot, and I loved it. It takes a little practice, but it really changes your look with a beautiful, more sculpted finish. Favourite blush: Right now it&apos;s Lise Watier Havana Bronzing Powder -- I&apos;m in denial about winter. This is the perfect blush because it makes me feel sunkissed all year, and looks natural without ever looking orange. Favourite face powder: I don&apos;t really wear foundation unless it&apos;s for work. But for everyday wear, I dab a little MAC Studio Finish Concealer under my eyes and lightly brush on Coty Airspun Loose Powder in Translucent. It&apos;s the secret gem of a lot of make-up artists both here and in the US, cheap and cheerful. I first discovered it in Miami -- all the artists on big campaigns were using it! It is my #1 buy south of the border. Favourite eye shadow:Black Tied, a velvet-texture black shadow with silver sparkles, from MAC. I get a soft, smoky grey or dramatic shimmery black depending on my application. I&apos;ve been wearing this shadow pretty much exclusively lately -- it works with the sort of Cleopatra thing I&apos;ve been doing with my hair. 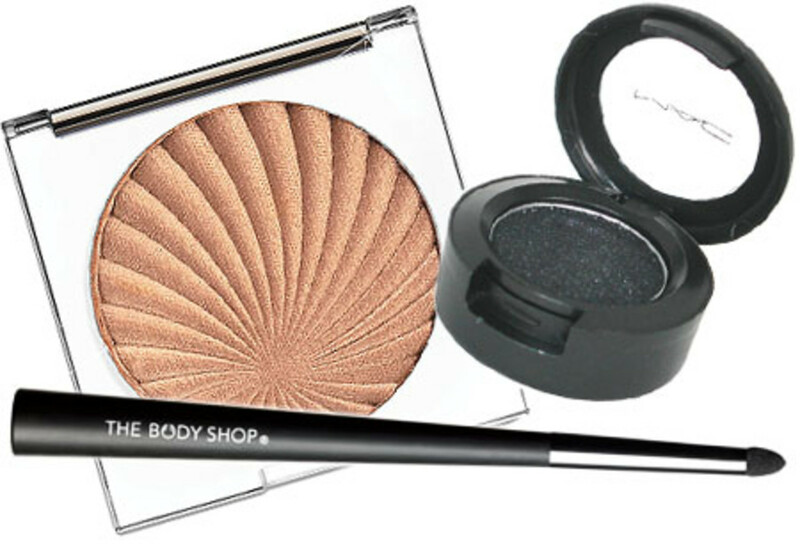 Favourite makeup tool:The Body Shop Line Softener, a smudger tool. I can&apos;t live without it -- it&apos;s so versatile! I use it to dab highlight shadow in the inner corners of my eyes, and to blend liner and shadow for a soft, smoky effect. Favourite lip colour: Right now I love the Bath & Body Works glosses, in particular the Liplicious Hot Cakes colour. It&apos;s that go-with-everything shade. Favourite hair product: For no-frizz, super-shiny hair, KMS California Silk Sheen Polishing Serum. I recently cut and dyed it a darker colour and the added shine really makes it look like a hairstyle, not just a haircut. Favourite fragrance: Breathe Energy from Bath & Body Works and 360 by Perry Ellis -- and both are discontinued! Happens to everything I love. So I&apos;ve been scouring eBay. I love them because they&apos;re light and fresh, and appropriate for any occasion, yoga class or an evening out. I usually layer the two -- the combination smells really pretty and I get tons of compliments! For information on tonight&apos;s show at The Rosehill Lounge, and on On the Curve Events, visit onthecurveevents.com. Follow Liis via @OTCurveEvents and @LiisW. Models clockwise from left: Melissa, Cindy, Meghan, Peace, the Ben Barry Agency. Photo of Liis W by Lily & Lilac.